Welcome to the current and 6 day weather forcasts for Hilo, Kona, Hawai'i Volcanoes National Park, and Saddle Road. Tide predictions are also given for Hilo. Note that the tide charts do not take local weather conditions into consideration, but only show the normal tide. The information on this page should not be used for Navigation purposes. New weather, and tide information is updated automatically every half hour. This page is brought to you by InstantHawaii.com. Visit InstantHawaii for the latest weather, news, hikes, trails and parks on the Big Island of Hawai'i. Overcast @ 6500 ft. 10.00 mi. 67°F NA in. NA mb. - - 29.97 in. 1014.7 in. 0.03 in. Overcast @ 4200 ft. 10.00 mi. 67°F NA in. NA mb. Clear 10.00 mi. 36°F NA in. NA mb. 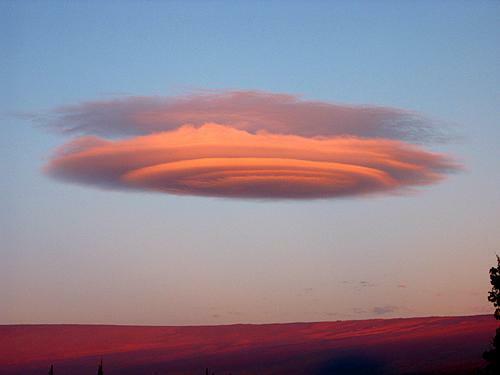 rare lenticular cloud over Mauna Loa at sunrise. shows Mauna Kea covered in snow from 13,796 ft down to 8,500 ft.